Jeff Francoeur, who’s utterly lovable now that he’s not playing right field for the Mets everyday, sent 20 pizzas and an autographed bat to some A’s fans that impressed him with a Bacon Tuesday outing last year. 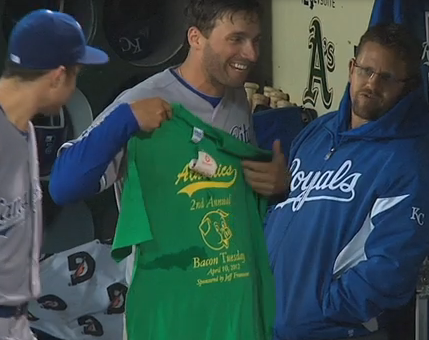 The group in turn sent Francoeur a Bacon Tuesday t-shirt. Look at how happy he is! Watch a video explanation of Francoeur’s role in Bacon Tuesday here. Yeah, Jeff Francoeur rules.